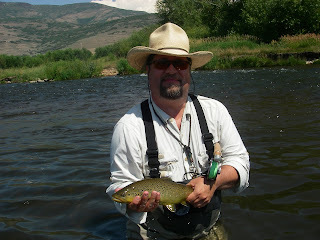 Sandie and I spent a long weekend fishing the middle section of the Provo River in Utah. This stretch of river is located in the Heber Valley between the Jordanelle and Deer Creek Reservoirs, about 50 miles east of Salt Lake City. We spent two days fishing with guide Craig Costas who guides with Four Seasons Fly Shop http://www.utahflyfish.com/ in Heber City. We spent a day on our own attempting to apply what we'd learned from Craig. The plan was to learn a new area to fish. As the cliche goes, the fishing was great, but the catching was slow. The guided days were turning into a guide's nightmare until the middle of the second day when we finally started hooking and landing some very nice browns. Then we were catching something on a pretty regular basis, with a final catch of about 8-10 fish. guide's insight into what I need to teach my casting clients to better prepare them for trips to the Provo, or any other western trout stream. Later on in this post, I'll include some of Craig's comments that are insightful. A special treat surfaced after a little bushwacking to find a new fishing location on the river. We looked down the river and there was a moose that was crossing right where we had been about 10 minutes earlier. I've included a very short video clip of him in the middle of the stream. Very cool! Our third day was our day by ourselves; armed with the knowledge we got from Craig and Aaron at the Four Seasons Fly Shop. We got up too late and definitely got into the river too late. Getting a good Southwest boarding pass got in the way of an early start. That's the sign of a true Southwest Airlines customer, boarding pass is more important than fishing!! Temperatures were up in the high 90's and all of the good spots were taken. We went to lunch and decided to fish "Lunker Lane", just below the Jordanelle Dam, later in the afternoon. We got to the new spot at 3:30 as instucted. The sky started to cloud up and things cooled down. We found a nice spot downstream of Lunker, which we were told was a good place to go if the main section got crowded. At about 4Pm the promised caddis hatch began and the fish were boiling, there were rises about every 15 seconds. Sandie hooked and landed a little on the Elk hair caddis that she was fishing. I didn't have much luck with anything. Lots of great casts, perfect drifts, not fish. I change flies until I'd tried everything the fly shop sold us. In desperation, I pulled out a fly that I have great success with catch browns of the Pecos River in New Mexico - the Little Brown Fly. Within two casts, I was hooking fish. But lost the fly to a big one and I was pretty much done for the day. Rain and lightning sent us home after about two hours fishing. We'll go back. There's lots of potential and the fish we caught were nice. Nymphs used were split case pmd. split case green drake..uncased caddis lite green..stallcup baetis dark brn...bead head pheasant tail..loop wing emerger pmd,..
As for the deep water nymph rig.....In high water you need to get deep.. mid day sun force the fish deep so you gotta get there. We seldomly change the distance from the indicator to weights. 6-8' is needed here. Changing the weights used gets you to the depth needed. As for casting ....a tight line means you can get the weights up before casting forward...I always suggest waiting for the flys to swing to shore...then a slow lift before the actual cast forward... bringing the tip of the rod behind the downstream shoulder makes casting across the stream a snap. The motion is one movement not a two part motion.